Here’s a list of all the TV’s that are currently available on Paytm Mall Maha Cashback Sale at a discounted price along with reasonable cash back offer. Paytm Mall is hosting a Maha Cashback Sale that will run from November 1 to November 7. The e-commerce platform is offering up to Rs 20,000 cash back on TVs and other large appliances during its sale period. Besides that, interested buyers will also get a 10% cashback on their purchase when they will make payment through Axis bank credit or debit card. 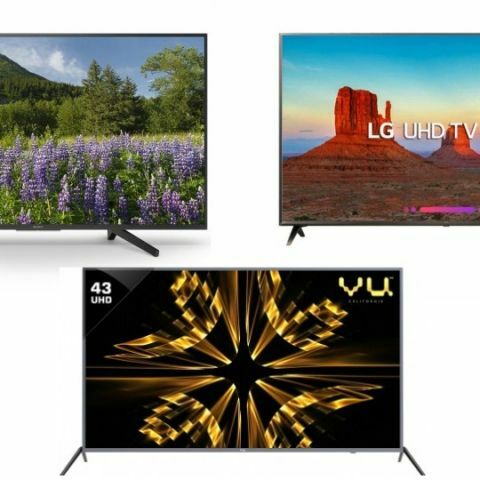 In this lister, we have added the best deals Paytm Mall has on TVs from brands like Sony, LG, Vu and more. The Sony 43-inch Full HD Smart LED TV offers a resolution of 1920 x 1080 pixels. The TV also gives users an option search using their voice. View deal here. The LG 43-inch UHD LED Smart TV offers a resolution of 3840 x 2160 pixels. It has built-in Wi-Fi and offers Bluetooth connectivity, letting users connect a speaker or headphone to the TV directly. View deal here. The CloudWalker 55-inch FHD Smart TV offers a resolution of 1920 x 1080 pixels. As it is a smart TV, one can also download and watch content from apps like Netflix, Youtube, and more. View deal here. The Vu 43-inch 4K UHD Smart LED TV has built-in Wi-Fi for streaming music & videos from apps like Youtube, Hotstar, Voot and more. It is equipped with multiple HDMI and USB ports as well to connect external devices. View deal here. The Kodak 32-inch HD Ready Smart LED TV offers a resolution of 1366 x 768 pixels. The smart TV features built-in Wi-Fi, that allows you to access and download apps on TV such as Netflix, Hotstar and more. View deal here. The TCL 55-inch 4K UHD Smart LED TV offers a resolution of 3840 x 2160 pixels and comes with a panel size of 55-inches. With built-in Wi-Fi, one can also download apps and stream movies, TV shows and video on TV. View deal here. The LG 43-inch Full HD Smart LED TV comes with a full HD display that offers a resolution of 1920 x 1080 pixels. This smart TV allows you to watch videos and movies of your smartphone on the bigger screen via Miracast. You can also download apps and stream movies, shows on the TV. View deal here. The Sony 49-inch Full HD Smart LED TV offers the same features as the Sony 43-inch TV that I have mentioned earlier in the list. It comes with a panel size of 49-inches and offers a resolution of 1920 x 1080 pixels. View deal here. how is the result of TCL C48P1FS or TCL L43P1US ?